Those that read DUBUS magazine will be aware that G0KSC introduced the world to the concept to of wide band, low impedance designs. 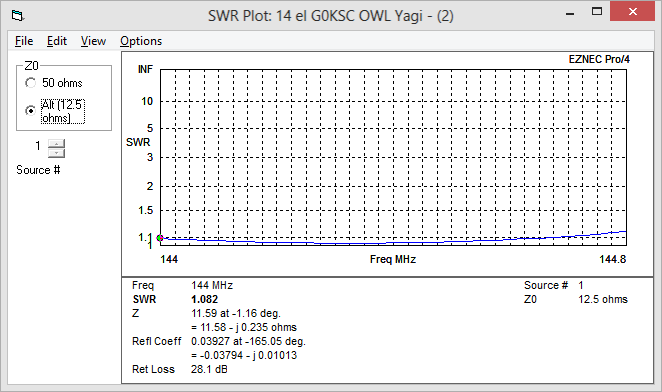 Yagis with excellent performance became commonplace within the ham community when K6STI first introduced YO (Yagi Optimiser) and AO (Antenna Optimiser). However, while these programs made Yagi design/optimisation easy, users were often blinkered by gain objectives and pushed their software tools for optimum gain. The easy route to gain is boom length and the power of thesoptimisers meant the boom could be extended, SWR dipped and once more the boom extended until such time that a Yagi was created with very narrow bandwidth that was unstable in wet weather conditions. Those 'that knew' would choose OWA (Optimised Wideband Arrays) which used split dipole feed systems exhibiting a perfect 50Ohm feed because although these were slightly lower in gain and did not posses such good F/B, they remained stable in terms of SWR, impedance and performance over much wider bandwidths than lower impedance antennas. The fact is now as it was then, a lower impedance antenna can be better (in all performance attributes) than a 50Ohm split dipole antenna. The belief that low impedance meant narrow band was simply through miss-use of the optimiser tools available. Different design criteria need to be taken into account when optimising lower impedance antennas, part of this is the concentration of the first few elements within the Yagi ('the driver cell' to coin a term used by DG7YBN http://dg7ybn.de/index.htm) and the optimisation of the Yagi within the Elevation plane rather than the azimuth plane (I am please to see ham antenna developers both home and abroad have adopted this approach for cleaner patterns now which was first used by my mentor YU7EF www.yu7ef.com). So what impedance is best? Honestly I would have to say for the best balance of gain, F/B and bandwidth (by bandwidth I mean the flat-line of SWR, Gain and F/R (Front to Rear)). Martin, DK7ZB's (http://www.qsl.net/d/dk7zb/) 28Ohm is about as good as it gets. However, while I have modelled, built, experimented with and used 28Ohm Yagi antennas, my goal remains to be one were the driven element is arranged or shaped in such a way as to provide a 50Ohm direct feed. A low impedance Yagi that self-matches in its own structure to 50Ohm. There is nothing wrong with the DK7ZB match (while on the subject of DK7ZB) in fact, it is far better than any other matching arrangement I have seen because it is not another metallic structure attached to the driven element (that is not modelled in the design phase) causing all sorts of pattern distortion, it is coax sitting at the point in the boom where coax would be and if at the point where the 2 x 75Ohm coax cable join to your 50Ohm line, the braid is connected to the boom, there is no need for a balun either, two jobs in one without any distortion. The challenge of making something 50Ohm by means of using a different type of driven element to the split dipole was exciting and a direction perhaps others had not explored. There was no where for me to go with a 50Ohm split dipole Yagi. As much as I tried using various different optimisation methods, YU7EF had it pretty much spot on in almost every case so the ultimate Yagi had to be elsewhere, away from 50Ohm split dipole types. 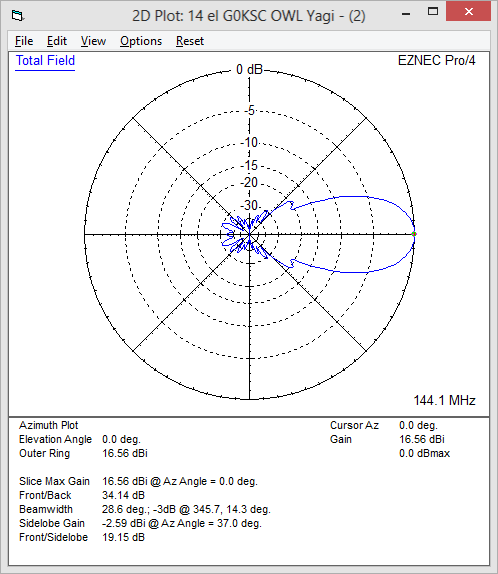 In one of my DUBUS articles several years ago, I spoke of optimising a 50Ohm split dipole Yagi between 144MHz and 145MHz for best performance and comparing it with the same Yagi now optimised with a 40Ohm feed point impedance (still split dipole). 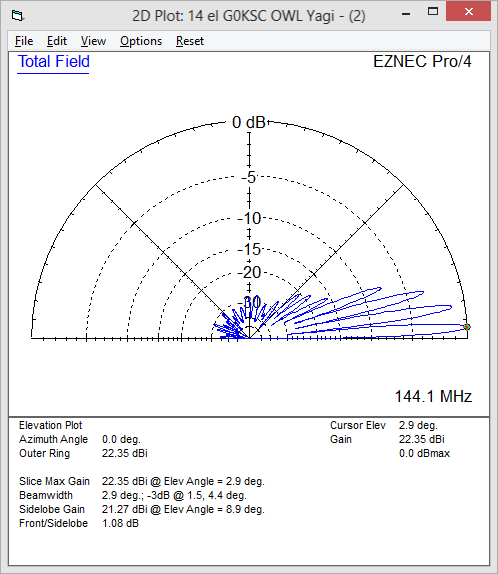 I could achieve better performance in terms of gain and F/B on the 40Ohm Yagi than I could on the 50Ohm Yagi or I could optimise the 40Ohm Yagi for the same performance over a wider bandwidth. It was clear then, lower impedance could be better. The OWL came from the abilities of the folded dipole which has a 4:1 transformation ability. This meant I could model a 12.5Ohm Yagi, add a folded dipole and it became a 50Ohm direct fed antenna with a noise reducing closed loop feed system. Nothing new there, this had been done before but when added to a wide band 12.5Ohm Yagi that was stable in all weathers, the benefits were clear to see. This new low impedance wideband design was called the OWL and again was first published in DUBUS magazine (www.dubus.org). since then I have made many developments and improvements to this design although few designs have been published on this site over the last year or two since the start up of my own antenna company InnovAntennas (www.innovantennas.com Europe and ROW www.innovantennas.us North & South America) where I have designed and developed variants of my designs (LFA, OWL, OP-DES & LFA-Q) for commercial, government and military applications. However, this year will be different. I have a long list of OWL designs with G/T busting performance figures on 144MHz and an excellent balance of gain and bandwidth on 50MHz & 70MHz. Attention to detail has been paid on the suppression of the pattern in all other areas than forward-facing with careful and time consuming (and sometimes tedious!) optimisation again and again moving the control parameters forward 1 degree at a time before performance starts to drop off (indicating a limit has been reached). There is no one perfect stacking arrangement for EME, don't be mislead here. For your needs, mail me and we will work out what is best for you.